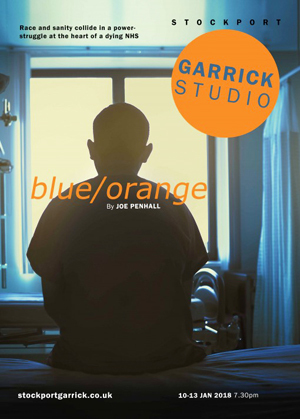 My first visit to Stockport's amateur theatre flagship company, The Garrick, this evening proved to be a most interesting and thought-provoking one indeed. The play was new to me, and although it is a very wordy and quite lengthy play, it sustained my and the whole audience's interest and concentration right to the end. This play was performed in their 'studio' theatre, which is a clever but simple conversion of their bar to make an intimate 40-seater space, with a small performance area in the centre. Chosing to perform the play here was absolutely critical, due to the closeness of the action, and lack of set. The play suited this space excellently, and in fact, despite being sat on the second and back row, I still felt at times too far from the action and had to stop myself from interrupting the actors mid-speech with my own opinions. Perhaps I should tell you what the story was about. Written by Joe Penhall in 2000, the action is set in a London Psychiatric Hospital and we see a 24 year old black patient undergoing his final assessment before being released back into the community. Right from the start we can see that all is not what it appears to be and although this patient has stayed the required 28 days, and medically there is no reason to keep him longer, there are unanswered questions and doubts aplenty. He has been diagnosed with Borderline Personality Disorder, but that alone isn't enough for the doctor to justify keeping him in the hospital any longer, and yet he clearly doesn't seem able to live alone outside of the hospital. Enter Consultant Smith and his ego. This is a play which will challenge you. It is not an easy play to watch, and despite some well-placed humour, it is a play you have to listen to, concentrate on and long after the play is over you will find yourself questioning your own ethics, morals, beliefs, prejudices, etc. Whilst watching the play, your opinions and support will change with every new sentence, challenging your belief in the NHS, your thoughts on mental health and support workers, and indeed what classifies mental illness - or who is fit to classify it! Further, there are deep-rooted issues of race and racial stereotyping within the play which, eighteen years after the play was written, are as relevant and poignant as ever. In this production of this three-hander, the role of the patient, Christopher, was played by Joseph Jacobs. His nervousness, jitteriness and paranoia were excellently placed and he gave a fully-rounded and very believable performance. The young doctor in whose charge he was placed, Bruce Flaherty, was played with unerring realism by Matt Todd. As something of an aside, I myself have had dealings and contact with many mental health care professionals over the last few years as both my parents' health has deteriorated, and so I can say with some authority that Todd's characterisation was absolutely spot-on! Finally, another very believable and nicely balanced performance came from Martin Pritchard who played the egoistic and self-aggrandising Consultant Smith. An excellently chosen cast who worked well with each other, and in this particular play worked well against each other too. Directed by Janet Birkett, the play's themes were drawn out excellently and a lovely chemistry between the three actors was found. I did find the play quite static at times, but that was just a personal choice I think. I also feel that the character of Chris needed a little more energy at times too, especially at the beginning. Perhaps, as a suggestion, have the action to the first act start far more naturally by having Chris enter through the main doors once the lights are up on stage. The falseness (or perhaps I should say theatricality) of the play's start - blackout / lights up / action - seemed somehow wrong for the style of play and the space. I did notice that the pace of the play slowed and energy levels dropped half-way through the first act, and something was needed here (once Chris had left the stage and the two doctors had their long-winded duologue) to keep the action moving. It is an excellent play, and superbly acted by three talented performers who, even after wading through audition-worthy monologues, will make you want more. Thank you Stockport Garrick for introducing me not only to this play, but to your theatre and your company, and I hope to come back again very soon.